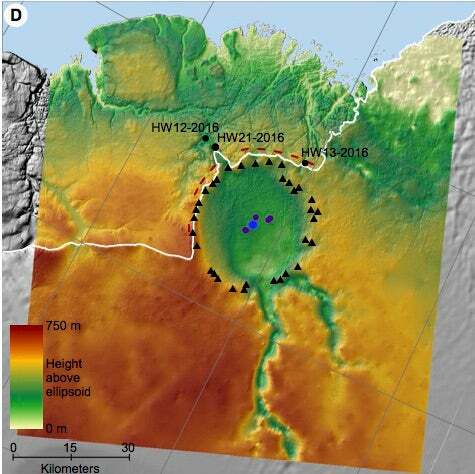 An unusually large asteroid crater measuring 19 miles wide has been discovered under a continental ice sheet in Greenland. Roughly the size of Paris, it’s now among the 25 biggest asteroid craters on Earth. An iron-rich asteroid measuring nearly a kilometre wide (0.6 miles) struck Greenland’s ice-covered surface at some point between 3 million and 12,000 years ago, according to a new study published this week in Science Advances. The impact would’ve flung horrific amounts of water vapour and debris into the atmosphere, while sending torrents of meltwater into the North Atlantic—events that likely triggered global cooling (a phenomenon sometimes referred to as a nuclear or volcanic winter). Over time, however, the gaping hole was obscured by a 1,000-metre-tall (3,200-foot) layer of ice, where it remained hidden for thousands of years. Remarkably, the crater was discovered quite by chance—and it’s now the first large crater to be discovered beneath a continental ice sheet. Larsen, along with his colleague Kurt Kjaer from the Natural History Museum of Denmark, immediately recognised that they had stumbled upon something special, but it soon became apparent that the depression would be hard to confirm as a remnant of an ancient asteroid strike. 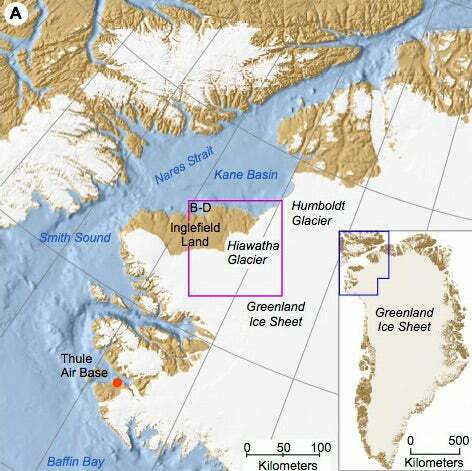 The first step was to analyse aerial surveys taken of Greenland from 1997 to 2014 by researchers from the University of Kansas. 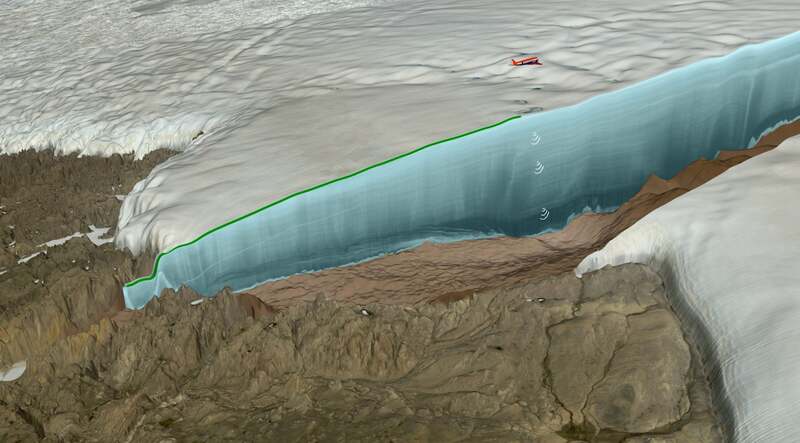 But the data resolution of these surveys “was not sufficient,” according to Larsen, so a team was sent to Greenland to collect superior, higher-resolution ice-radar data of the Hiawatha glacier and the bedrock beneath. This was accomplished in 2016 using wideband ground-penetrating radar (or in this case, ice-penetrating radar) developed at the University of Kansas. That said, signs of the impact crater were also visible to the naked eye. Next, the scientists visited the edge of the glacier to collect river samples. Some of the minerals they analysed exhibited the telltale characteristics of a catastrophic impact, such as shocked quartz grains and other impact-related grains, such as glass. 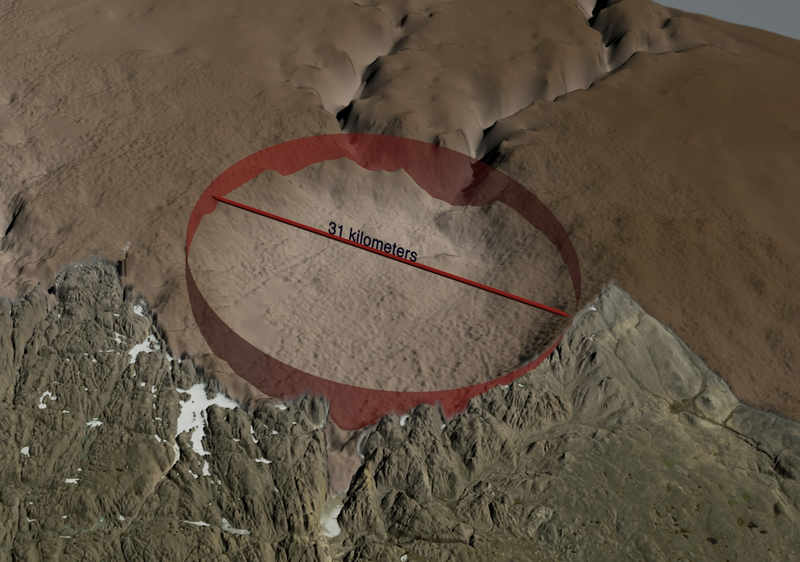 Some pre-glacial channels were seen below the ice sheet at the site of the crater, which suggests the Greenland Ice Sheet was already in place when the asteroid struck. The exact timing of the asteroid strike, however, is fairly vague, with the researchers saying it happened between 3 million and 12,000 years ago. But preliminary evidence suggests it happened relatively recently. The crater appears to be well-preserved—a surprising observation given that ice is a powerful erosive force. The crater is likely fairly young from a geological perspective. Also, the incident was severe enough such that evidence of the impact should be detectable elsewhere on the planet. The impact likely triggered a global cooling event by delivering copious amounts of debris, dust, and water vapour into the atmosphere, blocking incoming solar radiation. At the same time, melting ice from Greenland’s ice sheet would have reached the North Atlantic, causing a weakening or shutting down of the North Atlantic current—the current that provides western and northern Europe with its relatively mild climate. Evidence of the impact should thus exist within our planet’s stratigraphy, allowing for more precise dating of the impact. Archaeologists and anthropologists could also help in this regard, to see if and when ancient populations of humans were affected by an asteroid strike dating back to this time period.